If you've made music with a Soulsby synth, post it here so others can hear it! Okay, I recognize this isn't the most active forum, but with any luck maybe I won't be the only one participating? 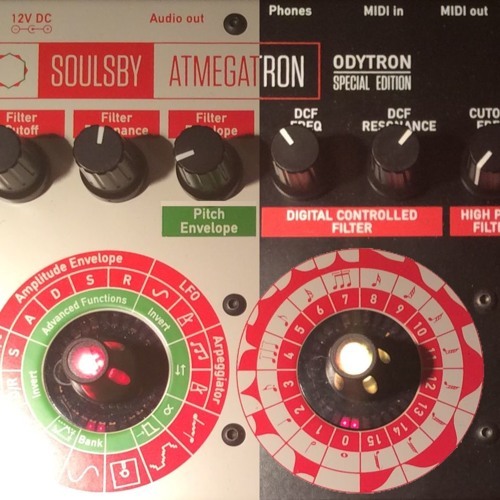 Atmegatron: All synths and sound effects. The vocal was a random clip from the radio. "The longer we go on, the more we can see when we look back. Hidden meanings emerge; deeper layers become more clear in retrospect. We get the jokes which were too subtle or dark to catch the first time, and we laugh... even if it's bittersweet, even if maybe the first time through we cried in pain and confusion. It's all a matter of perspective." It's a slow burn, but I like it. I hope you will too. Thought i'd post my first live performance with my Atmegatron. Let me know what you think. Cool, that's a nice relaxing tune with a good mix of soft and crunchy sounds. I'm not entirely clear on your setup. Some of the cables are hidden, and it seems there's a sequencer running somewhere. How is your audio chain set up, and what's driving the Atmegatron, and which parts come from which devices? It looks like pads from the Blofeld, drums obviously from the MachineDrum, and the analog bit at the end from the BassStation, with some crunchy leads from the Atmegatron, but that still leaves at least one instrument unaccounted for and I'm not sure how you've set up timbre control on the Atmegatron. You've pretty much nailed it there. The additional instrument comes from the Blofeld. This is all sequenced on the MachineDrum which provides the drums and vocal samples too. I connect everything via an iConnent Midi 4 which i've never had any issues with. All audio is then routed to a Cymatic Audio LR-16 for multitrack recording. Wow! ToyKeeper ... good chippy sounding - only the beat sounds to me boring (the slip) - it has not much variety. But the lead & arp are simple great. Are the lead sound & arp from Atmegatron and how did you made it multitimbral? - did you record single tracks one after the other? To make it multitimbral, I recorded several tracks one at a time and layered them. Everything in the songs came from the Atmegatron, except for the drums and the vocal sample. Mostly, I use the OP1 as a 4-track tape recorder and drum machine, recording and arranging performances from other instruments. Drums in The Slip were indeed pretty boring... I didn't really even try to do anything with that. It's somewhat more interesting in the second song though. The main difficulty I ran into with this setup is that the KP3's effects don't have key tracking. If I do a resonant lowpass delay, for example, the lowpass frequency doesn't change per-note... so the resonance stays at one pitch and causes ear fatigue. I may see if I can patch the Atmegatron through a Microbrute instead, with identical midi sent to both devices, in order to get key tracking on the filters and perhaps add an extra envelope and LFO. You mean, something like an "envelope behaviour". I am not familar with kaos Pad, I think it's more limited. But atmegatron has envelopes too, for a creative sound modeling! 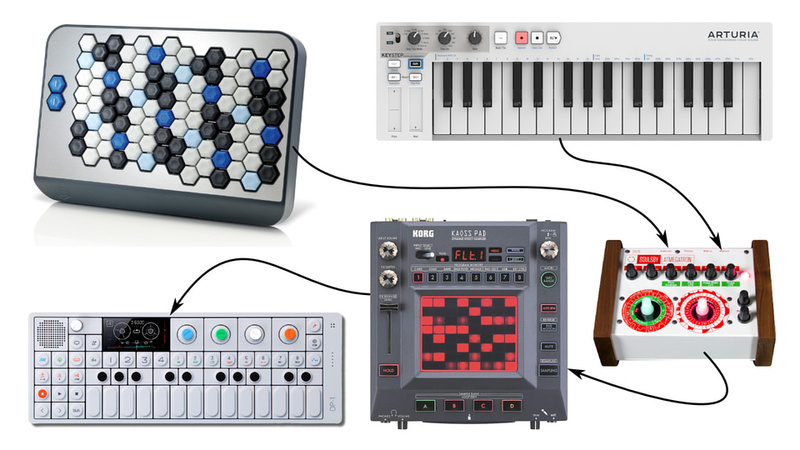 Otherwise, If you like to program sequences by hardware you can control some parameter of your kaos pad (x-,y-axes) by definable CCs from your arturia keystep or even OP-1 (but it's sadly usb...). Never saw OP-1 before, but it looks like a great versatile seq/device. The main difficulty I ran into with this setup is that the KP3's effects don't have key tracking. ... I may see if I can patch the Atmegatron through a Microbrute instead. I went the Microbrute route, and it works very nicely with the Atmegatron. I can basically treat the Atmegatron as another oscillator, using all the same processing that its built-in oscillators go through. If I send identical midi to both devices, they stay completely in sync and I can even use key tracking. It sounds pretty good by itself, but if I want to add extra depth to the sound I can turn on the built-in oscillators at the same time. This adds a whole nother dimension to the Atmegatron, combining 8-bit digital sounds with retro analog waveforms to expand the sound and make it growl. And, of course, it still goes through the KP3 for a variety of other effects. here is my first tune, where the odytron sets the rhythm and Atmegatron plays the melody - regardless of any other instruments I used for that song (SID, 303, virus, p2k). That's pretty good! Very classic chip sound plus more. I'm not entirely sure whether the lead in a middle section was a processed Atmega or something else though. It's, um ... Let's see. The song structure seems like the patterns are laid out as "AAbBBCCDDEEFFFfDDDd". The lead in part C is what I'm not sure about. Overall though, I think it went together well except a couple spots which stood out to me. I found the transition from "A" to "b" a bit odd, and also what seemed like missing notes in the melody of part D, but mostly I thought it was very good. And though the notes seemed at first to be missing, it worked as a nice effect when D came back later. I've been dragging my feet on a song lately. I have most of it ready but still need to record the melody tracks more carefully. Aside from drums, the entire thing is made using what I call the "Atmegabrute"... a.k.a. an Atmegatron routed into a Microbrute, then through a KP3 for delay. Same midi signal sent to Atmegatron and Microbrute, so it effectively uses the Atmegatron as an oscillator on the Microbrute, running through all the same envelopes and filters and such. It gives me a nice 8-bit tone but with extra bite and an easier interface for shaping the sound. Hopefully I'll finish the song soon so I can put it online. Oh, um, the song structure thing comes to mind largely because it's a thing I'm bad at and my current in-progress song is largely to try to get better at it. I laid out a structure with the bass line and then tried to put other stuff on top. The bass goes "intro ABAC bridge ABAC end", and I'm still working out the melodies. The song is stored in the hardware sequencer, which uses a few more instruments of various devices, which I then recorded live. I'm not entirely sure whether the lead in a middle section was a processed Atmega or something else though. Part C is definitely the SID part. But there, the phase of the two channels could be better. The SID instrument is a sync + ring modulation. Part D starts with Atmegatron lead..., Part b/B starts with odytron rhythm. The Arps are all from a second SID board. And though the notes seemed at first to be missing, it worked as a nice effect when D came back later. I've been dragging my feet on a song lately.... Hopefully I'll finish the song soon so I can put it online. I laid out a structure with the bass line and then tried to put other stuff on top. That's fine. I think I always start with the beats (which could also be a bit more varied) and then I work on the bass and back to the beats. It often happens to me that some parts are a bit too stiff, a little more variation could make the thing even more lively. I forget to granulate the parts even more. .. and what I unfortunately do not use enough are my two old speech synthesizers! Well, as it turns out, dragging my feet was an understatement. I still haven't gotten back to it, months later. I've spent most of my music time lately looking for a better way to do midi sequencing, so I can capture ideas while exploring and then clean them up for a more organized render later. And I just got a Digitakt to help with this, and to serve as a drum machine. Hopefully it'll help me stop dragging my feet and actually get some songs done. I really like the combination of Atmegatron and Microbrute, retro digital plus retro analog in a single dirty sound. yeah ..for sure, that's important. I really have to listen here under bad conditions at work, but what I have listen so far sounds fantastic (both songs)!